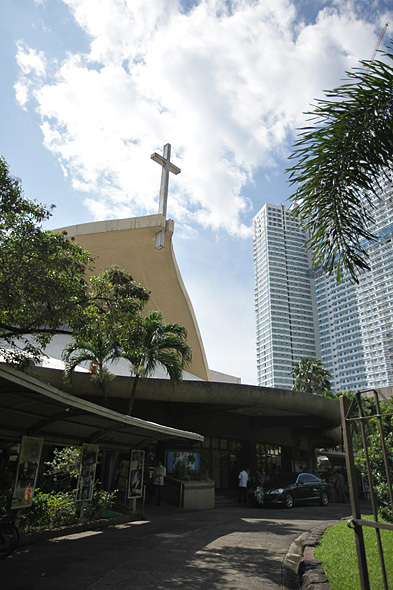 St. John Bosco Parish Church or Don Bosco Church is located along Arnaiz St. formerly Pasay Road, at the corner of Amorsolo Street in Barangay San Lorenzo in Makati City. St. John Bosco Parish was founded in March 1976, after the late Jaime Cardinal Sin, then Archbishop of Manila, recognized the need for a new parish by residents of San Lorenzo, Legazpi and Salcedo villages, and Dulo in Barangay del Pilar, all in Makati City. 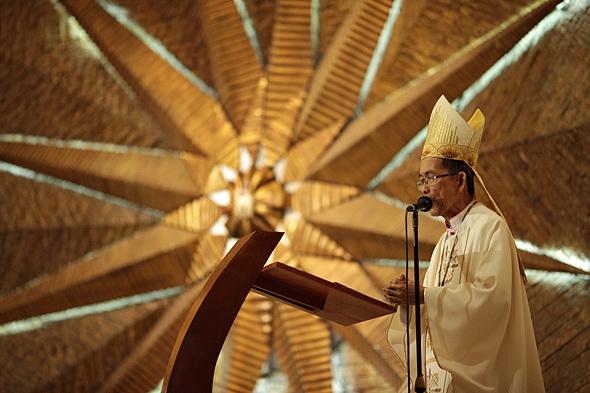 Fittingly, the church grew as a full-blown parish, beyond serving the needs of the adjacent Don Bosco Technical Institute, to filling the spiritual needs of office workers and nearby residents of Makati City. The parish compound today boasts of other facilities such as conference halls and even a funeral parlor, all surrounded by clean landscaping. The patron of the church is St. John Bosco, more popularly known as Don Bosco, a 19th century Italian priest, educator and writer. He was called “The Father and Teacher of the Youth”, having dedicated his life to improve the welfare of the disadvantaged youth such as street children and juvenile delinquents. He founded the Salesians of Don Bosco (SDB), so called after St. Francis de Sales whose spirituality and philosophy Don Bosco followed. Don Bosco’s statue, along with Sts. Dominic Savio and Laura Vicuna, two young saints closely associated with him, can be found in front of the Makati church. 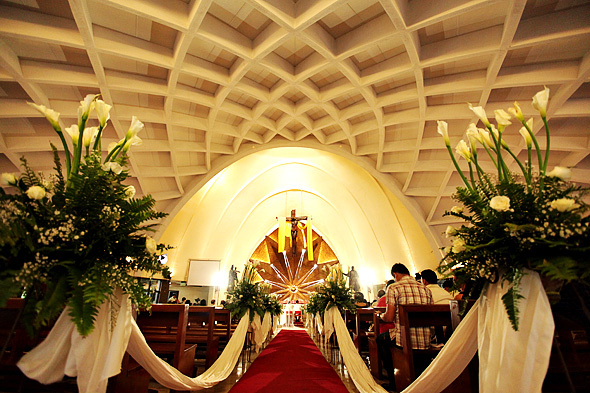 St. John Bosco Parish church in Makati City is a popular wedding venue mainly because of its architecture, if not for sentimentality between the couple. The church’s architecture, composed of geometric designs, strike the eye without taking away the impression of simplicity and elegance. The entrance alone is shaped like the arched edge of a leaf, marked by a cross at the pointed center. Inside, the white ceiling is designed with waffle-like lines crisscrossing each other as they radiate from cream-colored arches. At the center is a gigantic dark golden star – which actually seems like three concentric stars, one on top of the other. 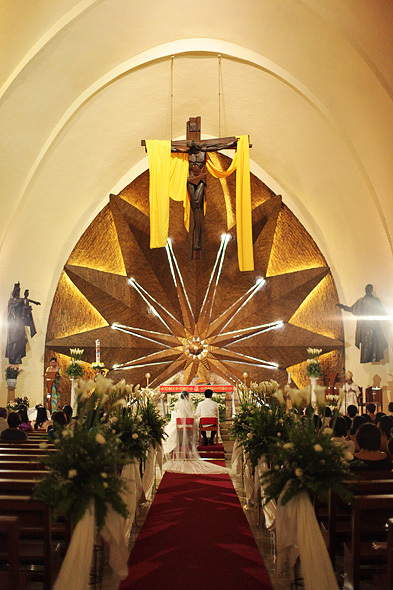 The star is a magnificent backdrop for the altar, over which hangs a giant crucifix, and, when backlit as they are during weddings, makes a dramatically good background for pictorials. Wedding reservations in this church need to be made for no less than three months before the wedding. 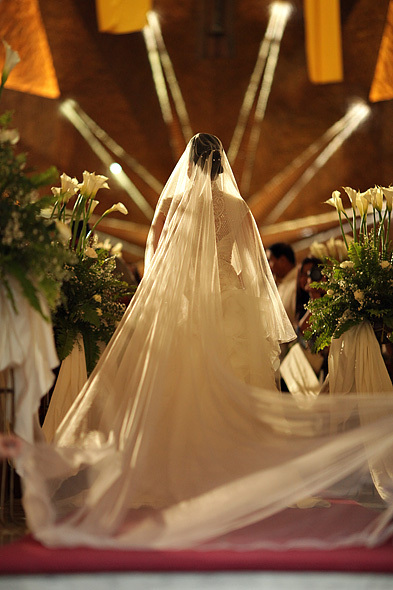 The parish charges P22,500 for air conditioned weddings and P17,000 otherwise. The required non-refundable deposit is P2,000, with the balance paid two weeks before the wedding date. Charges cover the ceremony; registration forms; marriage certificate; red carpet; flowers at the altar and along the center aisle; nuptial and unity candles; booklet for the couple. An additional fee of P500 is charged for the use of electrical devices such as chargers, video lights, etc. There is also a P5,000 “punctuality” deposit required, but this is refundable if the wedding ceremony starts at the scheduled time, based on the clock at the church entrance. Documentary requirements are the usual: baptismal and confirmation certificate, marriage license, banns, etc. The parish also conducts canonical interview, marriage counseling, marriage preparation seminar, and confession and rehearsal for the couple. Aside from these requirements, the St. John Bosco church enjoins couples to follow certain regulations. Only individuals aged 21 years and above are given clearance to wed. Ring and coin bearers, as well as flower girls, should be no less than five years old. Those with indecent clothing, such as those with plunging or revealing necklines or backs, are not allowed inside the church. The bride’s mother will be designated to receive the marriage certificate, candles and booklet immediately after the wedding ceremony. Wedding singers should bring their own instrumentalist. The pictorial (within the church) should include only the members of the entourage. The church allows showering of rice, confetti, flowers and similar items at the entrance of, not within, the church. St. John Bosco church allows weddings to be held from Monday to Saturday at 8:30 and 10:30 in the morning, and at 2:00 and 4:00 in the afternoon. Weddings are also allowed at 7:00PM on Saturdays and 2:00PM on Sundays, but the couple will need to bring their own priest. Wedding anniversary masses, meanwhile, need to be scheduled for appointment.